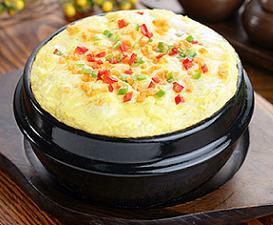 Gaeranjim is a Korean steamed egg casserole which is quite popular and often eaten as a side dish (banchan). The main ingredients include egg and water with optional ingredients such as green onions, red pepper flakes, salt, ground pepper, sesame seeds and/or other types of vegetables. Water can also be substituted with chicken, beef, or seafood broth to make it more flavorful. Preparing this dish requires whisking eggs and water (or broth) until they are completely blended in a creamy like consistency. Some prefer to add other vegetables such as mushrooms, onions, bell peppers, and sweet corns to add their own twist to this dish. Green onions, red pepper flakes (gochugaru) and sesame seeds are usually added near the end of the cooking process for extra flavors. Cooking gaeranjm requires extreme attention and patience to make sure it is not overcooked or burned. A light and fluffy consistency is usually sought for when making this perfect egg casserole side dish. Popular ways to cook gaeranjim is by placing a bowl with the content mixture inside a pot of boiling water or it can also be cooked by boiling the ingredients in a ddukbaegi (ceramic stovetop-safe bowl) under low heat. Whisk 3 eggs in steam-safe bowl or ceramic bowl. Add ½ cup of water or broth (chicken, beef or seafood). Add salt and ground pepper. Chop green onions and any other desired vegetables. Add and stir vegetable(s) to mixture. Sprinkle remaining optional ingredients such as sesame seeds and/or pepper flakes. If steaming on stove, place steam bowl in steamer for approximately 10 minutes over medium-high heat. You can also just put the bowl in a large pot with a few inches of water at the bottom for approximately 15 minutes over low-medium heat. If using a ceramic bowl, place egg mixture on stovetop over low-medium heat for 15-20 minutes until you reach desired consistency.